It was at this point that we retired our efforts for the year but during the winter months we tried out our pizza oven multiple times. The verdict? The pizzas were good and they were considerably better than the pizzas we were able to make in our 1st pizza oven, but they could be better. It was difficult to to get fires to light which we figured out was because the smokestack was not drawing enough smoke because it was too short. The bottom of the pizza was not cooking as quickly as the top of the pizza. We think the reason is because the heat was being absorbed into the concrete instead of pushing out from it. The heat from the fire caused some minor cracking and heat was escaping through the cracks. 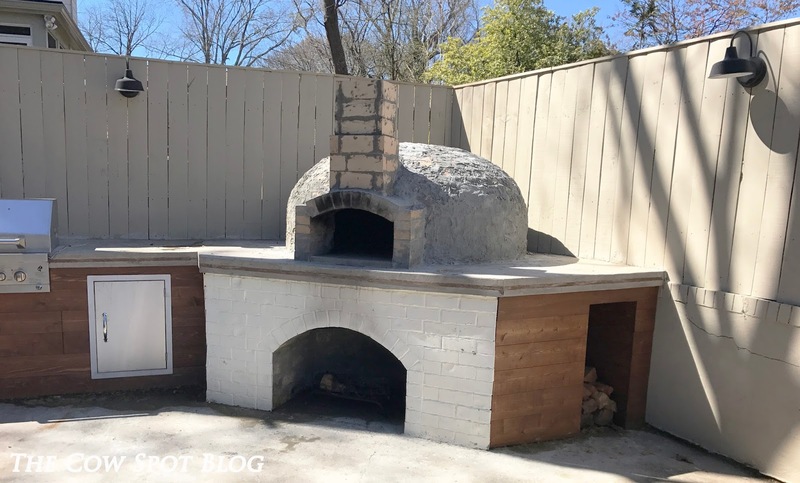 Brent did a lot of research, mostly on-line and a little bit by eating/observing local pizza joints with wood burning pizza ovens (I was especially helpful during this part of the research process) and came up with a game plan. A few weekends ago while I was touring southern mansions in Eufala, Alabama and Croix was playing with his aunt and uncle, Brent got to work ironing out some of the kinks. 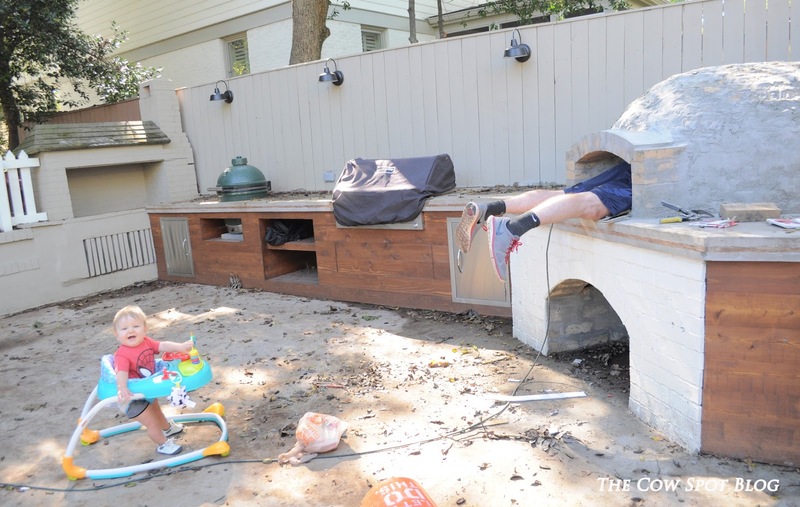 To start he added more bricks to the chimney taking it from 28" to 48" high. To address the cracking and heat escape, Brent filled the cracks with fire mortar and then rolled on a ceramic fiber blanket. This particular material had great reviews and is specifically intended for wood stoves, pizza ovens, kilns, etc. 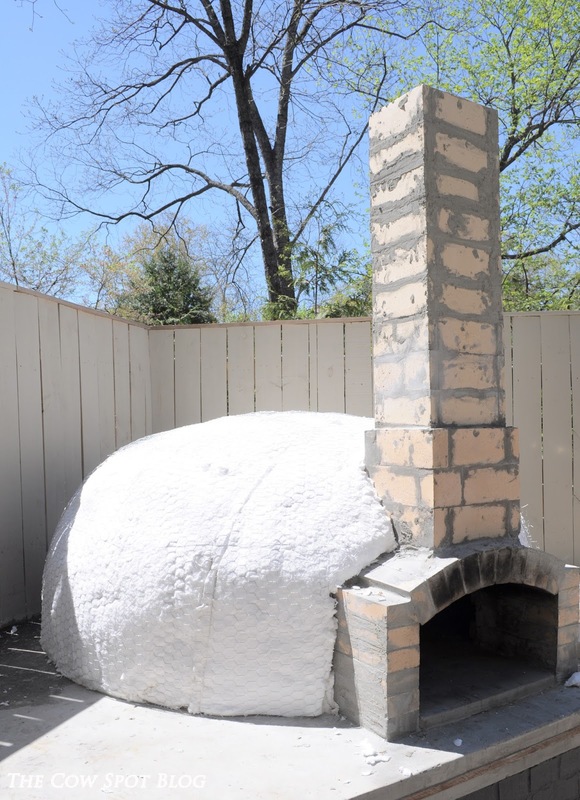 The Internet suggested 3" or 3 layers of the insulation, but he felt like 2" or 2 layers was sufficient. 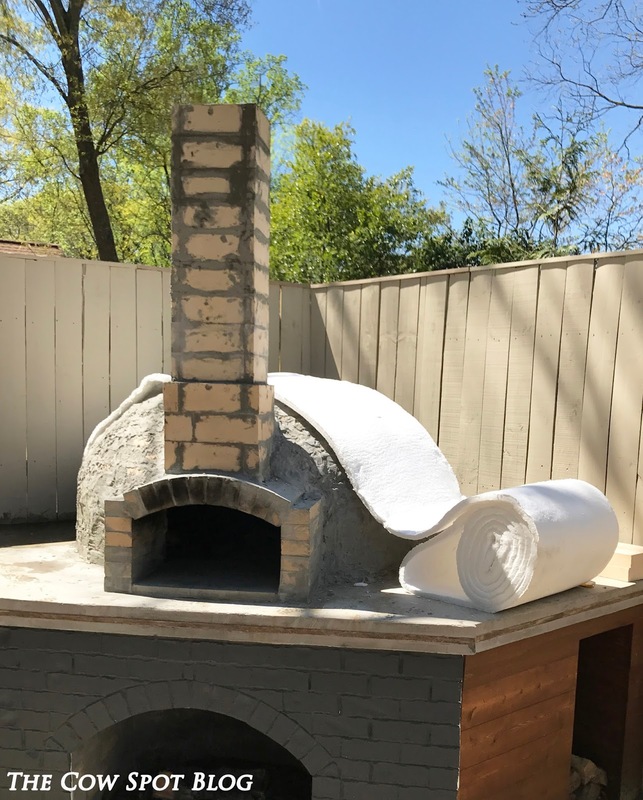 As a point of reference, our pizza oven is just under 5 feet wide and it took us just under 3 boxes to cover the whole thing twice. 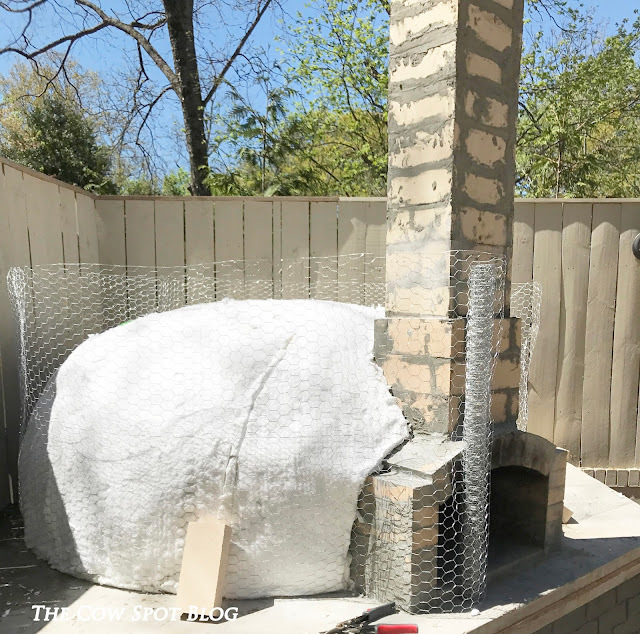 After the two layers of the insulation Brent wrapped the dome with chicken wire in preparation of the mortar application. 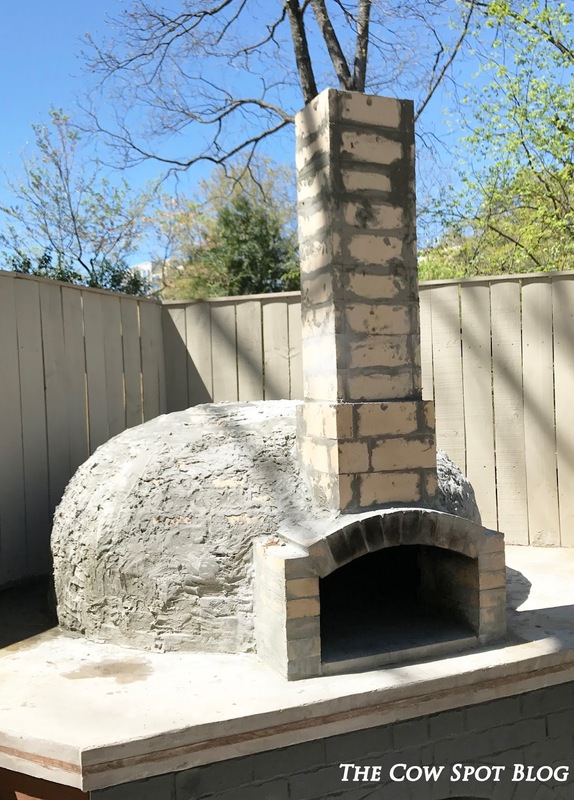 Once the insulation and chicken wire was installed he spread cast able, insulating refractory mortar around the entire shell. A.) It helps the dome hold it's shape (i.e. cast able). C.) Refractory means it won't crack or break under high heat. So basically, this little jewel solves a lot of our problems in one foul swoop! At the end of this stage we will be ready to pull the trigger on the finish work for the facade of the pizza oven. 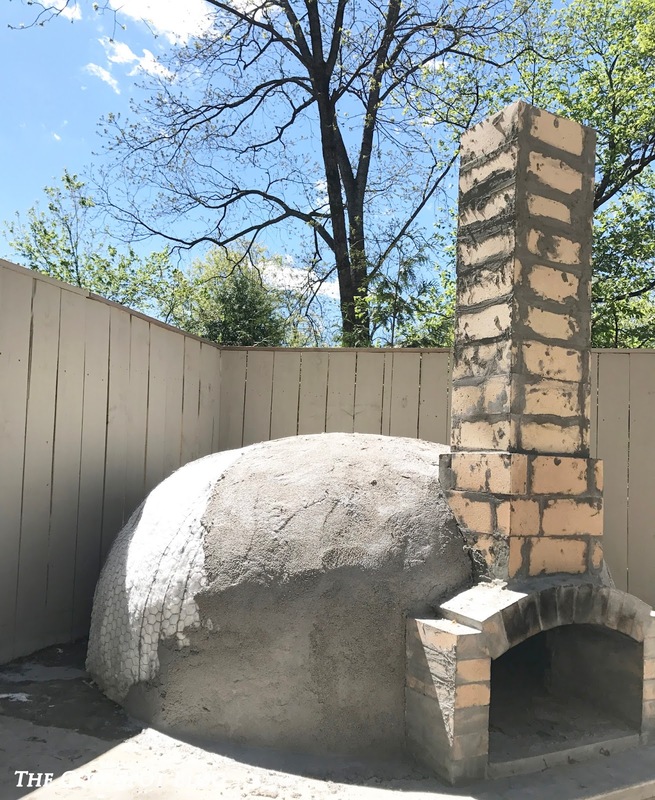 We are moving right along and I just know I will be writing the title " DIY Pizza Oven REVEAL" soon!